A Clean Seed Agricultural Technology, with its new highly advanced CX-6 SMART Seeder is an high innovation in world agriculture. The CX-6 SMART Seeder offers an unrivaled level of precision in modern no-till seeding. The CX6 SMART Seeder is reflected by company product reps as a “crossover,” merging the typical features of a planter and a seed drill. This drill demonstrates the future of farming. On top of that, CX-6 SMART Seeder offers wireless application control of up to six different products simultaneously to control in a highly-managed way in seeding in every square foot on the field. The CX6 SMART Seeder set's new standards; a single row, front folding toolbar on tracks with mounted tanks, all cast opener assemblies, plug & play electronic VR metering insied the pods on each row opener with gentle product handling, individual point shutoff and overlap control highly precision metering at the opener. You need 5 to 6 horsepower per opener to pull this. Nutrient requirements fluctuate as frequently as soil, however the request for different nutrient applications do not change proportionately to each other. Some nutrient requirements go up, while others go down. To solve this challenge is by handling the products separately. Wireless control powered by SeedSync™ for accurate on-the-fly metering input control. 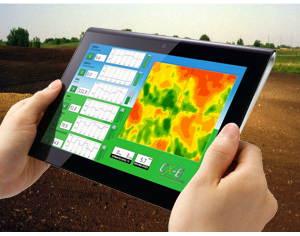 Utilizing full integration of detailed Field/Soil mapping on the fly. The CX-6 SMART Seeder deploys up to 6 products simultaneously to create pinpoint perfection in seeding in every square foot on the field. Current conventional air seeder technology simply cannot do what we do. 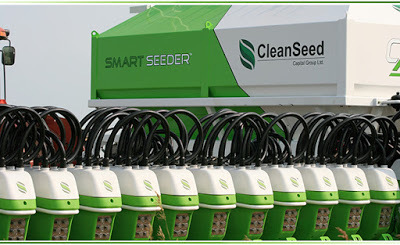 The Smart Seeders unique Variable Rate delivery system deploys precise rates for up to 6 different products independently at each opener spanning the entire drill. These advancements will allow farmers to place fertilizer and seed populations exactly the right amount at every square foot of the field. In addition to, the correct rates will be applied when turning corners at each opener or avoiding hindrances. Clean Seed recognized that in order to be more efficient with inputs, the CX6 SMART Seeder designs a drill that puts down only what you want it in every square foot the field, where you want and when you want. Farmers will see the result of new drill through overall yield gains, improved seed handling and placement, high resolution site specific management, overlap elimination, and logistics management. And while much of the technology employed on this drill may be new to seeding equipment, Lempriere uses systems already common in other industries with its data logging capability. 0 Response to "CX-6 SMART Seeder, a Clean Seed Agricultural Technology"